OVERNIGHT OATS are pretty easy. They require minimal planning ahead and help keep you full until your next meal due to a higher protein and fiber content (as compared to rolled oats and many cold breakfast cereals). I like my oats made with water but you can switch water for milk (or alternatives) and increase the protein content of your breakfast and make it creamier. My first tip is to leave your oats or oat combination (I fill it half with a flax cereal and half with steel cut oats) in a container that you can easily pour from like a recycled milk jar. Fill your morning bowl with oats. For 2 people I usually have approx 1 cup of oats. You’ll have to play with this as it depends on your appetite and what you have with breakfast to fully decide the right amount of oats for your bowl. 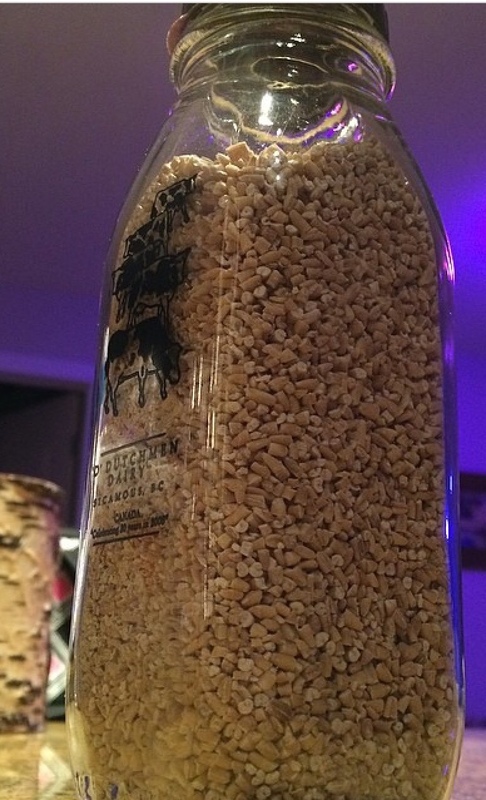 Cover your oats with cold water and fill to another centimeter above your oat line. This will almost always require a trial and error approach. Some like their oats sticky and I prefer mine a little more wet/runny. Put your oats in the fridge overnight. In the morning fill the rest of your bowl with fruit (I generally use frozen) and microwave 1-4 minutes depending on your microwave strength. Or heat it in a pot. Monitor your oats for appropriate temperature and if microwaving be mindful of explosions! If it is too runny try adding some flax meal, wheat germ or oat bran to the bowl to absorb excess water. I generally have a sealed jar of the three combined on my counter for the days the oats need a little thickening up. It’s a great tool to have on hand as I also use the same mix to thicken most soups and sauces. Add it teaspoon by teaspoon until you have desired thickness. Serve warm as is or with milk/alternatives. Wheat germ, oat bran and flax meal mixed together in a jar. Apple Pie Oats. Chopped apples, vanilla, crushed pecans and cinnamon boiled with cream of wheat and my oat mix from above. Mixed fruits and cinnamon oats. My favorite type of oats are PB&J oats made with frozen raspberries and peanut butter. Switching out raspberries for apples or bananas is recommended! 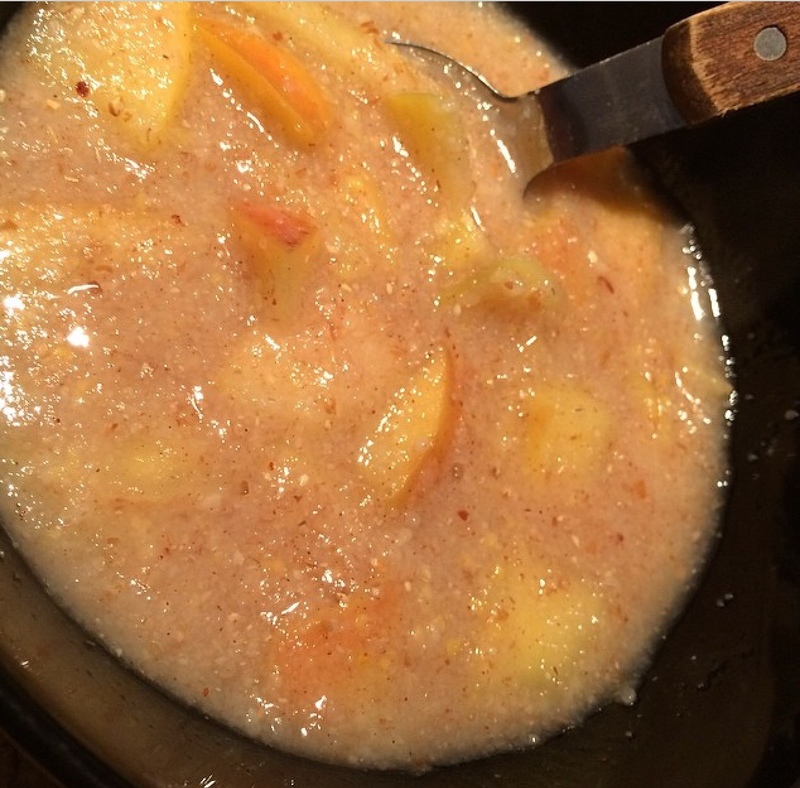 Peach cobbler oats are another favorite of mine, I mix cinnamon, applesauce and canned peaches (in water) with cream of wheat, steel cut oats, and red river cereal. I boil the ingredients together in a pot with a dash of cinnamon. For more breakfast ideas click here and here.